A lovely place to stay. A great house, a wonderfull swimmingpool and not forget two wonderfull and fantastic owners: Dora and Sergio. Pistoia is a nice village to visit and not far to visit also Firenze, Lucca and Pisa. Thank for your kindness Dora and Sergio. la famiglia Di Kristien è una realtà davvero bella due ragazzi educati e affettuosi .e due genitori attenti e premurosi . hanno lasciato la casa in ordine . e si sono attenuti ad un comportamento corretto.Sono davvero ospiti che rendono piacevole anche la nostra ospitalità , speriamo che ritornino . Wir, Ehepaar mit 2 Kindern (6 und 9 Jahre alt) sowie unserem Labrador, durften 14 Tage im August 2018 bei Dora und ihrer Familie verbringen und waren vom ersten Moment von der Gastfreundschaft als auch der Unterkunft überwältigt. So durften die Kinder mit Dora Pizza backen, auch alle Fragen wurden umgehend mit viel Einsatz beantwortet und trotzdem hat Dora sehr auf unsere Privatsphäre geachtet, so daß man sich von der ersten bis zur letzten Minute willkommen und auch ein wenig zu Hause im positiven Sinne fühlte. Die gezeigten Bilder können das Original nur skizzieren. Der Ausblick ist traumhaft, der Pool toll und auch das Haus ist liebevoll eingerichtet, wenngleich es ein wenig dauert, bis man einen Platz für die eigenen Sachen findet. Die Auffahrt ist für deutsche Fahrer, zumindest für mich, ungewohnt und abenteuerlich, da einspurig und mit Gegenverkehr ist immer zu rechnen, macht aber in der Nacht umso mehr Spaß. Jedoch beträgt die Fahrzeit für die ca 6km nach Pistoia (nächste Einkaufsmöglichkeiten/Lidl, Coop, etc) ca. 15min. einfach. Das sollte man wissen, meiner Meinung nach. Ansonsten war es ein Fest für uns und wir möchten uns noch einmal bei Dora und Sergio herzlich für alles bedanken! Wir haben einige Tage bei Dora und Sergio in Pistoia verbracht. Wir haben uns dort sehr willkommen gefüllt. Unsere Gastgeber haben uns sehr herzlich empfangen und sich immer gut um uns gekümmert, mal wurden wir mit Pasta, mal mit selbstgemachtem Brot verwöhnt. Wenn wir Fragen hatten, haben Dora und Sergio uns immer geholfen. Das Haus ist sehr schön und liebevoll eingerichtet, man hat wirklich alles was man braucht. Der Pool ist einfach traumhaft. Wir bedanken uns ganz herzlich bei Dora und Sergio für einen traumhaften Urlaub und wünschen ihnen alles Gute! Séjour agréable dans un endroit charmant, certes retiré mais calme, reposant et offrant une vue magnifique sur la plaine. Idéalement placé pour visiter Pistoia, Pise, Florence, Lucques voire Sienne! Et que dire de la charmante et exquise Dora, toujours disponible, attentionnée, douce, cultivée, et de bon conseil pour les visites à effectuer. Gartenmöbel und Pool etwas gewöhnungsbedürftig! We stayed one week in summer 2017 in Dora an Sergio's most beautiful site. We felt most comfortable there. The house is located quite high up the mountains near Pistoia. Do not loose patience when passing the small streets through Torbecchia and up towards San Vito. You will have been sent excellent directions to find the place, just follow them! You will arrive at very large premises with lawn, oil trees, wine and some more nice trees and bushes and most likely at first be welcomed by Gipsy the friendly dog. Dora will be there then to present the guest house and garden. This lovely house is well equipped and decorated with warm love and exquisite taste. You will find many pictures of your host's family and even some canvas painted by Dora herself who among many remarkable skills also is a gifted artist. The house's large garden is equipped with several terraces providing calm and sunny places. You are allowed to use all these nice places as well as the large swimming pool. 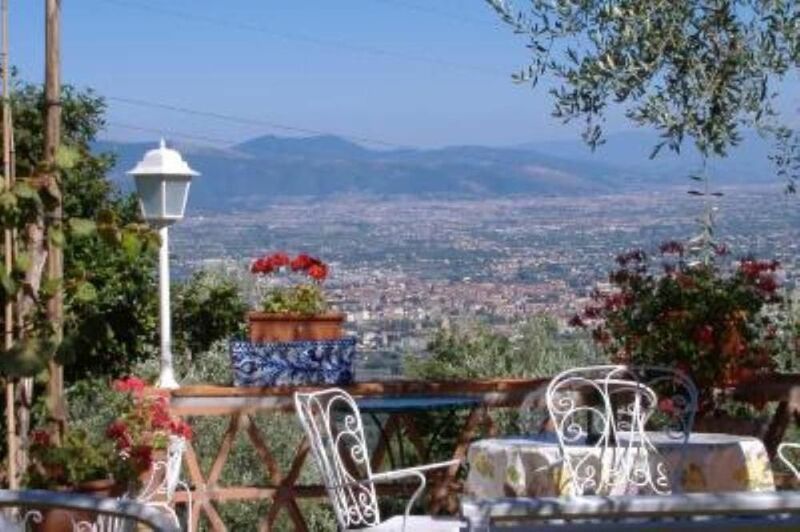 We especially recommend the upper terrace's breathtaking view at night presenting the enlightened towns of Pistoia, Prato and Florence at your feet! Your hosts are very friendly and warm persons who make any effort to help their guests and make them really feel at home. They live next house and are accessible at any time. We were lucky to have met Dora and Sergio, hoping not for the last time! To summarize: It is a perfect place to stay for holidays. Drive down the street and in a few minutes you are in Pistoia to do the shopping. In Pistoia you can easily take the motorway to explore all the Tuscany highlights. And when you return to your domicile the world's trouble and hectic rush seems to disappear immediately. Una casa che fa volare – a house that makes you fly! Gli ospiti che sono stati nella nostra abitazione sono persone di grande cultura . Hanno apprezzato sia le bellezze del territorio che l'atmosfera che offriamo ai nostri ospiti . Persone con una grande sensibilità ed educazione da rendere gratificante .anche per noi che ospitiamo ,la loro scelta .Auguriamoci di rivederli tra noi ! take the motorway A/11 Firenze Mare ,follow directions for Pistoia,take the exit for Pistoia,follow directions for Abetone ,take the exit for Viale Europa,follow directions for Torbecchia San. Vito.